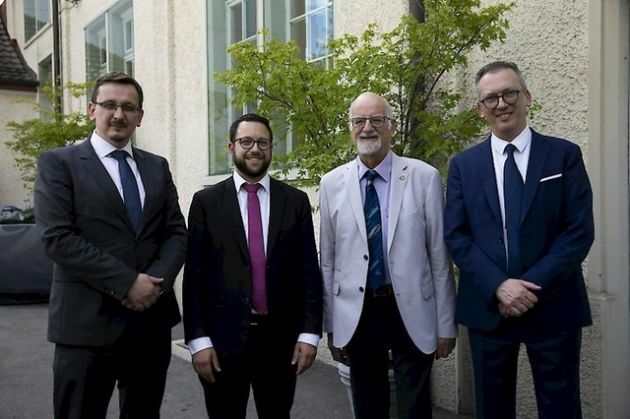 Swiss Jewish groups have honored four religious leaders, including a rabbi and an imam, for their efforts to bring religious communities in the country closer together. Awarded for the first time, the prize is from the Swiss Federation of Jewish Communities and the Platform of Liberal Jews in Switzerland. It is awarded to people who make a significant contribution to social cohesion and religious peace in Switzerland, Swissinfo reports. Two pairs of leaders were recognized with 10,000 Swiss francs ($10,000) in prize money: Imam Muris Begovic and Rabbi Noam Hertig from Zurich, Protestant deacon Maurice Gardiol and Jewish prayer leader Eric Ackermann from Geneva. Swiss President and Home Affairs Minister Alain Berse was among the speakers at the award ceremony in Bern, the country's capital city, on May 29. Begovic and Hertig support the project Respect, which facilitates cultural exchanges between the two communities. The project hosts various workshops, encouraging an active dialogue with the aim of dismantling mutual prejudices. Gardiol and Ackermann have developed an interreligious platform in Geneva. They also fostered dialogue between Jewish students and their non-Jewish peers through classroom visits. In addition, the two men have been active at the Geneva School of Social Work, where they teach a course on the role religion and spirituality play in social work. Muslims account for 5.1 percent of Switzerland's 8.2 million population while Jews make up 0.2 percent.